Did you know you can now order your Deliveroo takeaway from Tanya's here on View? 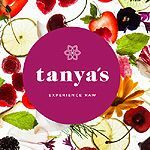 Tanya's is a raw food restaurant at Chelsea's myhotel Chelsea. The impressive meals and drinks are made using high quality, organic produce. "Tanya’s is a beautiful raw food restaurant and superfood cocktail bar in the heart of Chelsea. This cutting edge, living cuisine is as energising and impressive, as it is elegant. The menu is designed to reflect your busy schedule and provide loving nourishment at all times of the day. You can get your morning green juice or a coffee with hazelnut milk, a satisfyingly delicious plant-based burger and decadent raw chocolate cake for lunch, then come evening you can share a vibrant cashew cheese platter and superfood packed cocktails, that are made with only top quality, vegan and ethically sourced alcohol. Tanya’s is about blending innovative technique with seasonal produce and offering delicious culinary art in a classy natural environment. Come on over to myhotel Chelsea's beautiful conservatory for breakfast, lunch, 'after four' cocktails and platters or all day cold-pressed juices and raw chocolates." What did you think of Tanya's?